Strawberry raspberry smoothie, an incredible marriage of two most sought after berries in an icy cool smoothie is a must have experience for the summer. These heavenly flavorful and juicy fruits combined into smoothie with chia seeds and yogurt is a divine experience during hot summer days. You can use fresh strawberries if frozen ones are not available. 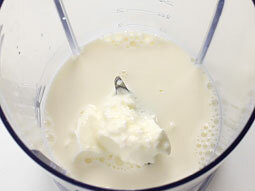 Pour almond milk in a blender jar and add plain yogurt. 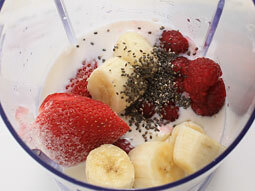 Add raspberries, strawberries, banana, chia seeds and sugar. 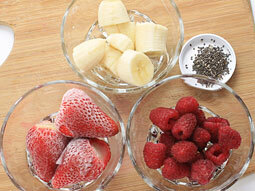 Blend until smooth and no chunks of fruits. 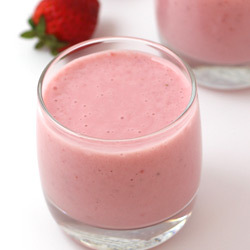 Pour prepared smoothie into chilled serving glasses. 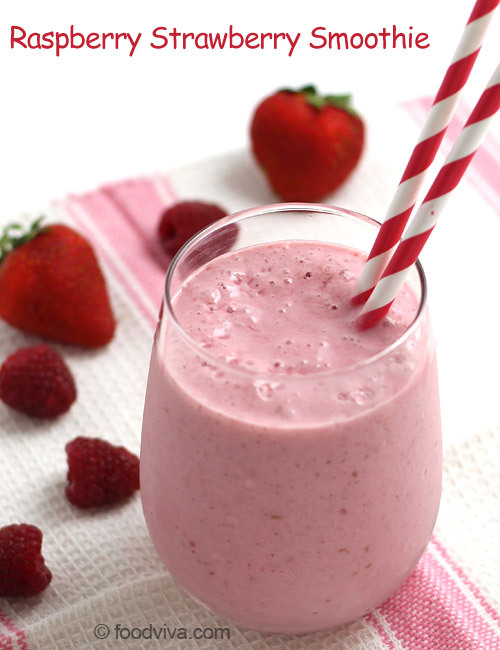 Add any one fruit (either strawberry or banana or raspberry) frozen to make thick smoothie. Always first add liquid in blender jar to get moving all the solid ingredients easily while blending. Taste: Refreshing and delighting taste of strawberry and raspberry with creamy smoothness of yogurt. 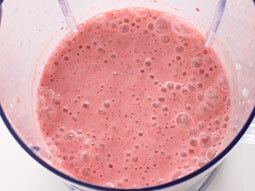 Serving Ideas: Serve smoothie of raspberry and strawberry as a healthy breakfast drink full of vitamin C and calcium. It can be also served as a party dessert or after meal dessert. This is an ideal summer cool drink recipe for kids. Thanks. I love this recipe so much I use it almost everyday.